Not a great picture, but if you look in the center, that's Eli 17.6, giving the thumbs-up as he goes to play golf yesterday. 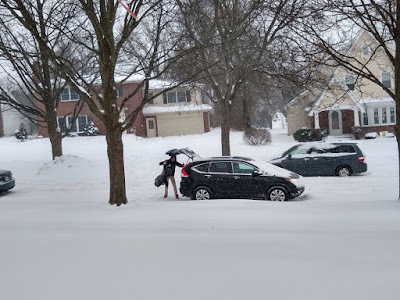 It snowed about 8 inches yesterday (most of it in about four hours), and the roads were so bad that he got a snow day from school. I think we're supposed to get another foot in the next three days. I snowshoed yesterday, and the snow was so deep that I couldn't stay on the sidewalk, because there was no sidewalk. Everything was just snow, with no way to tell where anything ended (not even the curb). The positive, though, was that I didn't need to go anywhere to snowshoe. I just walked out the front door. Also, it's going to get cold. Really cold. Wind chill of -35 forecast for tonight, which probably means that Eli won't be going to school on Wednesday (good for him). I think tomorrow is supposed to be one of the five coldest days in the history of Grand Rapids, or something like that. They said yesterday that non-essential personnel should stay off the roads. "I'm essential until I have breakfast," I said.